Financial investment in cycling can increase the share of journeys undertaken on bike, according to a new peer-reviewed study. This might seem like a do-bears-poop-in-the-woods sort of question but it's not always cut-and-dried that spending to achieve a goal actually works. Look at roadbuilding: billions of pounds are pumped into constructing new roads in order to reduce congestion, yet congestion keeps on increasing. However, if local and national government invested in cycling, there would be a quantifiable increase in the amount of cycling and a corresponding drop in journey made by private motor car, found the researchers from the London School of Hygiene & Tropical Medicine, who published their work in the journal Social Science & Medicine. For public health reasons this is exceedingly good news but to a car-centric Department for Transport (DfT) the study poses a problem: there's a deep fear of being seen to be waging a "war on motorists". The work is based on the Cycling Demonstration Towns project by Cycling England, a quango abolished by the government in 2010. I asked three people at the DfT for comment on the study, which also highlights the health and environmental benefits of cycling, but none replied. The researchers used census data to look at the impact of town-level cycling initiatives across the six towns, which received local and national government funding for measures such as cycle training, better signage, parking stands and more between 2005 and 2011. The researchers also incorporated data from the 12 Cycling Cities and Towns which were similarly funded between 2008 and 2011. The analysis compared changes in the proportion of commuters who cycled to work in intervention towns compared with towns that received no extra cash. 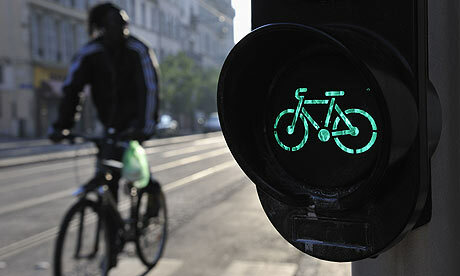 Overall, the proportion of people cycling to work in the intervention towns increased from 5.8% in 2001 to 6.8% in 2011. There was a significant increase in absolute numbers, and a decrease in the amount of people driving to work. Walking to work also increased. "It is encouraging to note that the increases in cycling were accompanied by decreases in driving to work. Notably, walking to work also increased somewhat in the intervention towns, suggesting the possibility for cycling initiatives to have wider beneficial effects on active travel behaviour. This was not an aim of the intervention programme, but it is possible that some intervention components did simultaneously encourage walking. For example, some of the new off-road cycling facilities (particularly greenways) seem often to have been perceived and used as shared spaces for cyclists and pedestrians, thereby providing improved walking opportunities." The intervention towns spent between £14 and £17 per person per year on promoting cycling, much higher than the English average of £1 per person. The All Party Parliamentary Cycling Group's Get Britain Cycling report, published in April, suggested that figure rise to £10 and later to £20. "This is an extremely rigourous and robust analysis of available data. Given the very short time frame of the Cycling England investment – in operational terms only about two years – it is remarkable that any change at all in travel behaviour has been identified. The absolute number of people who have taken up cycling is very positive, and represents a rapid shift in entrenched travel patterns." Cycling England always argued that changing people's travel behaviour was not a "quick fix", said Darnton. It "required a consistent integrated transport strategy and continuous long-term funding." "Overall, 14 of the 18 intervention towns had a higher rate of cycling in 2011 than would be expected from their cycling levels in 2001, and this research supports the international evidence that town-level interventions can be effective in increasing cycling. "However, we saw big differences in the level of success between different towns, and the population level effects were partly driven by a few large towns such as Bristol and Brighton and Hove which saw big increases. Although this means that we can't be sure what impact similar investment in other towns would have, our results do support the case for implementing and evaluating further town-wide cycling initiatives. Even though the changes we've seen are fairly modest, cities like London have shown that small increases in cycling can build over time." One of the most effective interventions in getting more people cycling, and walking, was "individualised travel planning", the study found. This involves home and work visits, pointing out how much quicker cycling can be for short journeys, and helping people find pleasant cycling routes to work. The study also pointed out that a great deal of the increase in cycling's modal share over the last decade has been from England's middle classes. However, with interventions in deprived areas, such as those done in the Cycling Demonstration Towns, there could be an increase in cycling in all socioeconomic groups. The DfT has yet to endorse the study. It also still has to publish a report completed in 2012 on an analysis of the Cycling Cities and Towns, prepared by Sustrans and Transport for Quality of Life.